Star Citizen's FPS module is coming along: RSI said a bit over two weeks ago that they're hoping to get players in sooner rather than later. That video embedded above is a short mini-documentary about the sound design, and it's interesting if you're looking for some insight into the science behind getting guns to sound good. It's also interesting because it's strewn with in-game footage of the FPS module. Officially dubbed 'Star Marine', the FPS module was revealed late last year and detailed more thoroughly back in May. "Where Star Marine differs from Arena Commander is that we’re not launching it in its most basic game. Instead, we’re trying for something more," Chris Roberts wrote in May. "It includes animation fidelity and attention to detail that you wouldn’t normally expect in an 'alpha' gameplay module. There’s even an entire sci-fi sports game with zero-G movement fully simulated and animated in there! (And don’t worry, there’s traditional FPS action too… with some new ideas that aim to set Star Citizen apart from the crowd.)" 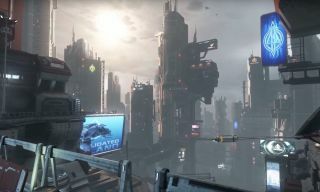 Despite ongoing controversies, Star Citizen is rolling out features fairly regularly: a social module rolled out late last month.